VLOOKUP and HLOOKUP are two of the most popular formulas in Excel and using them together is one of the first formula combinations that people learn. 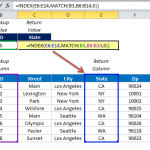 While using INDEX MATCH for vertical lookups and INDEX MATCH MATCH for matrix style lookups are superior approaches, it’s still a good idea to learn this formula combination and add it to your toolkit of lookup approaches. You may find yourself in a situation where you encounter this formula combination after inheriting someone else’s file, or you may just be working with someone who does not understand INDEX MATCH. 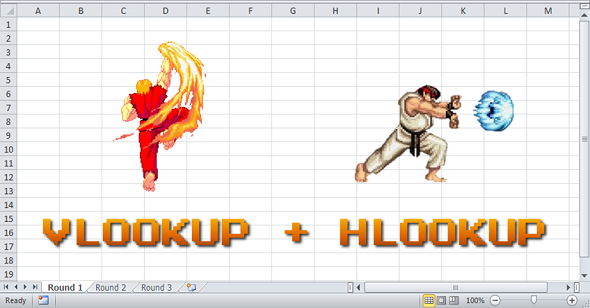 Both of these contexts make it worthwhile to learn VLOOKUP HLOOKUP. Your data table needs to have lookup values on both the top and left hand side. This requirement is specific to VLOOKUP HLOOKUP and is not a requirement of INDEX MATCH MATCH. If for whatever reason you cannot insert a row identifying the columns of your data table, use INDEX MATCH MATCH instead. 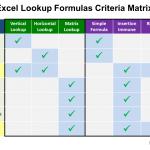 The syntax for VLOOKUP HLOOKUP is fairly simple conceptually. If you understand both VLOOKUP and HLOOKUP, all you are doing is replacing the column_reference component of VLOOKUP with the HLOOKUP formula. We’ll go into detail about both formulas below. 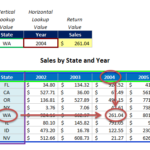 HLOOKUP has almost the exact same syntax and structure as VLOOKUP, with the exception that the lookup is occurring horizontally and therefore, you need a row index number instead of a column one. As mentioned before, the purpose of the HLOOKUP formula in this combination is just to provide the column reference for VLOOKUP to use. Step 1: Insert a row right below your field headings that identifies the column numbers of your table. This was the second baseline requirement mentioned for VLOOKUP HLOOKUP and is highlighted in green below. 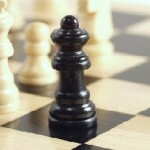 Step 5: For the table array, select the mini table you created when you inserted a row to identify the column headers. This table should only be two rows in terms of height. Step 6: For the row reference, input 2. This is because your mini table only has two rows, and you want it to return a value from the second row. Step 7: Close out both your HLOOKUP and VLOOKUP formulas with FALSE for the range lookup clause. This is because we want an exact match for both of our lookups. 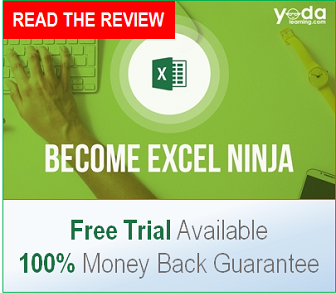 The first thing Excel does is process the formula from the inside out, thus addressing your HLOOKUP formula first. The HLOOKUP portion is fairly simple because we only have a table with 2 rows. In this case, the formula resolves to 4. Therefore, 4 will be used as your column reference for your VLOOKUP. Next Excel will process your VLOOKUP formula. The resulting value for the entire formula combination is $855.78. 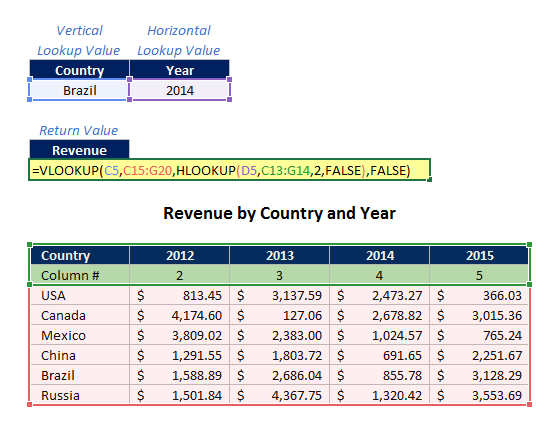 VLOOKUP HLOOKUP is a widely used formula combination because of the familiarity of the two formulas. 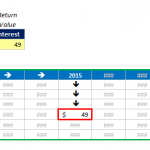 Despite its disadvantages, VLOOKUP is still a more popular formula than INDEX MATCH and understood by a much wider base of users. For that reason, understanding VLOOKUP HLOOKUP is still a worthwhile exercise. If you’re ever in a situation where you need to perform a matrix lookup, but either do not understand or plan to hand off your file to someone that does not understand INDEX MATCH, consider using VLOOKUP HLOOKUP as your lookup option. Instead of using HLOOKUP for getting the column index, how about using MATCH? In this way, you don’t need a helper row. When you need to write a formula that needs to update data from a certain source within multiple periods, vlookup+match formula seems more convenient since you cannot modify the main source (sometimes it is not possible to modify source excel file from database, i mean column # 2,3 etc..). Anyway thanks for your effort, it has been too helpful! technically you don’t even need the helper row. if the first row is numerical values, you simply need to subtract out the correct value from the HLOOKUP to return the row you want. Thanks for your tutorials, which have been critical in helping me understand matrix lookups, especially offsetmatchmatch. I want to get the sheet 2 column I value in sheet 1 cell G15 which wl be a combined result of column A & row 5. Sheet 1 column A part no need to match with sheet 2 column F, and sheet 1 row G value need to match with sheet 2 column G.
Both sheet are in 1 excel sheet.